I guess we’ve gone on a temporary break from Love Sick posts for a while, so it’s a good time to get back to the original purpose of this blog and start writing film reviews again. The next month or so is blockbuster season and I’ve decided not to spend time writing up reviews of the major releases. But my DVD, Netflix and Amazon queues are a bit out of control, plus there is a backlog of about 20 movies that I have seen in the past two months that I haven’t gotten around to writing up. I’m going to be busy. Based on the queue, though, there is definitely going to be a theme to the next set of reviews: young people. We’ve got quite a few movies about and for the millennial generation and how they are getting on in the recessionary world. I think I’m going to have to go and see Judi Dench and Helen Mirren movies to compensate. I hope spending so much time thinking about the youth of today and their problems doesn’t turn me into a geezer before my time. 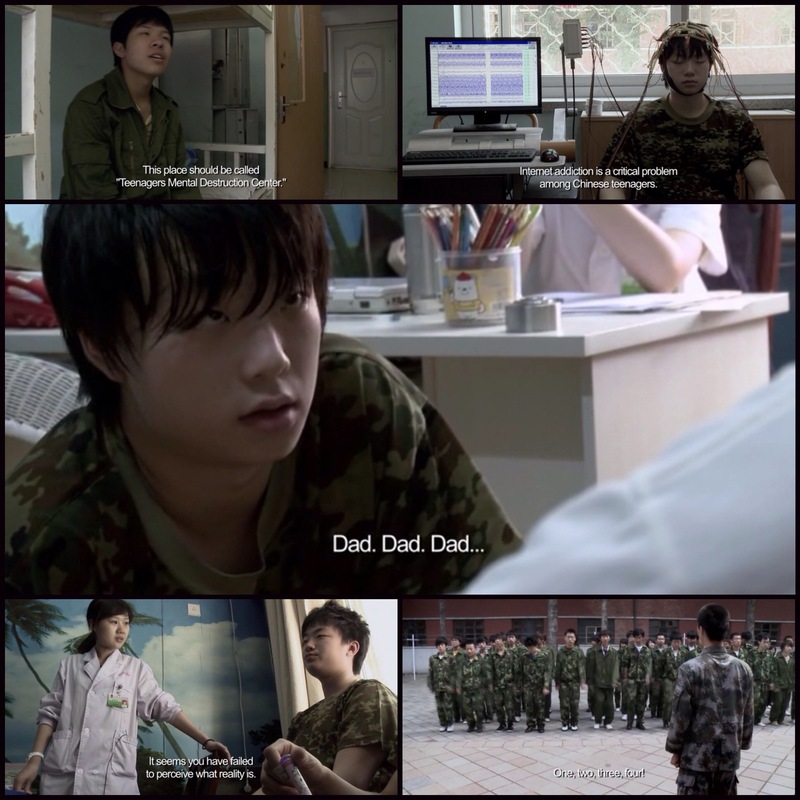 It is appropriate that the first movie in this series is Hilla Medalia and Shosh Shlam’s compelling 2013 documentary, Web Junkie, about primarily middle class boys in China who have had the misfortune to be institutionalized in a clinic to cure them of “Internet Addiction.” Nothing defines the middle class millennial generation globally more than its desire to be cruising down the information superhighway all the time. And nothing defines their parents, my generation, more than their confusion about whether that is good for them or not. The wonderful and terrible place that is the Web is a great and dangerous place for kids to hang out. That’s about as far as we’ve gotten after 20 years of muddled debate, but in my opinion, it’s probably the best vice ever. 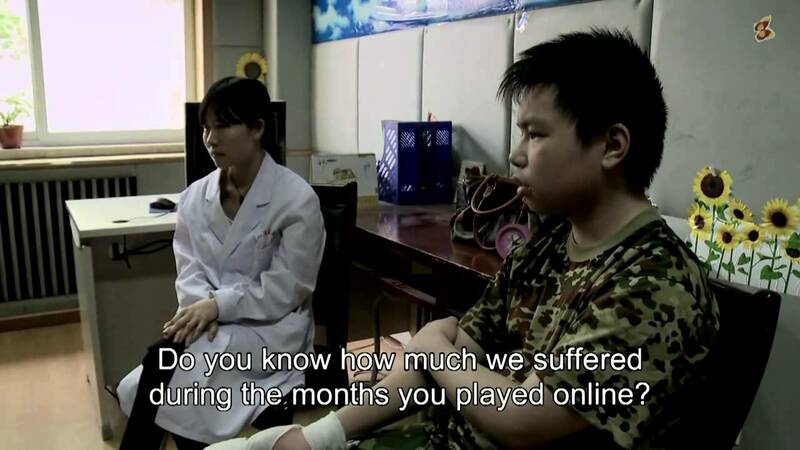 Chinese public health officials would beg to differ with me, and according to the movie, China is the first country to declare “Internet addiction” a specific psychological disorder and public health threat. At the time of filming Web Junkie, there were four hundred treatment facilities throughout the country. Medalia & Shlam were given access to one such facility connected with a military hospital and for the bulk of the documentary, we follow around a group of boys and their parents as they go through the drama of addiction counselling for the three to six months that they will be in treatment. Since the particular facility in the film is connected to the military, the regimented “boot camp” approach to treatment along with counselling and medication seems to be standard treatment method. On the surface, this kind of “de-programming” treatment of a disorder that seems specifically targeted at the social practices of teenagers seems suspicious and more than a little heavy handed. There are lots of modern vices that are addictive that don’t warrant “boot camp” treatment – nicotine, caffeine, and sugar come to mind. Even alcohol as a vice doesn’t lead to full confinement until the afflicted are much further down road than the youth in Web Junkie. But the health crisis model the authorities seem to be working from for Internet Addiction Disorder is one that is usually applied much more quickly to heroin, cocaine and other narcotics. A comparison of gaming with heroin is made quite frequently in the film. I’m not certain if I am buying that comparison, mainly because the neurological evidence that apparently supports this claim isn’t discussed in the film. Nor, for that matter, does the film dwell on defining the disorder that the kids are in treatment for, which adds to the feeling I have that the diagnosis may be arbitrary and meant to snag kids, especially boys, who have fallen behind in schoolwork because they would rather be gaming. I’m not certain if Medalia & Shlam decided not to discuss the clinical support for the existence of a disorder because they take it as a given that the Web can be addictive, or take it as a given that the adults are overreacting and using clinical psychology to control their children. I’m going with the latter, since I think through the stories that they tell following the treatment of three kids – Hope, Jacky and “Hacker” – they are trying to make a case that the cause of the problem is a inter-generational communication breakdown and a lack of other compelling social activities to channel each boys’ desire to excel at something other than school. Rather than dispute the clinical diagnosis, they ignore it to let the boys talk about their experiences online. It’s up to the audience to decide whether the behavior the boys are talk about is normal, or behavior that is so extreme that it is pathological. What the boys want is to win at an activity they want to compete in, rather than one they are forced to commit to by adults. The boys tend to look at their gaming as social time and talk about it in terms of sacrifice and accomplishment. Late in the film, Hacker complains that he spent a lot of time practicing and when he finally got very good at gaming, they cut off his access to it and sent him away. It does seem very unfair…unjust even, since these are all very normal goals that middle class kids have everywhere. At the same time, one of the boys admits to once playing a game 300 hours– which can’t be good, or even all that normal, although testing one’s physical limits is something teens do. Drug addicts test those limits, too, unfortunately, which is why the boys are stuck where they are. They refuse to see their computers as merely tools to accomplish goals. At the same time, lots of adults have spent time creating this tool and turning it into a playground. It seems hypocritical to suddenly decide to close the playground because it is popular. Instead of trying to balance the boys’ claims that they have no addiction with testimony against them from psychologists, Web Junkie focuses on the consequences of their activities and lets us sort out whether or not they have a problem. The focus is on the families who have to deal with unruly and sometimes violent teens who disappear all night long to the internet cafes, and who barely bother to communicate with them. It can be touching and harrowing at times watching clinical sessions with the parents. It would have been easy to neglect the parents and just focus on the boys, but Web Junkie is better for that balance. The Web isn’t actually consequence free and the fact that so many parents have decided to send their children to boot camp over it points to some kind of problem – a phenomena that is worth considering even if the film stops short of making a claim that it knows what that root problem is. This entry was posted in Documentary, movie reviews, USA and tagged 2013 movies, documentary, internet addiction, movie review, web junkie. Bookmark the permalink. The internet certainly has its very positive uses, like catering to our Love Sick addiction or reading excellent movie reviews from this blog. But “internet addiction” has also increased truancy in developing countries like my country the Philippines. Yep. That’s why it’s a wonderful vice. The issue is rather whether the addiction is like Heroin which really does require confinement, medication, and a broad network of social support to overcome…or whether one can wait and see…like we do with coffee. Or alcohol. Or chocolate. I don’t think you have to worry, Alem. There weren’t any lovesickos confined in China. It was primarily mmporg gamers. You should watch it and decide whether you think these boys have a mental disorder. I don’t wish to spoil the movie, but I will. One of the claims against these boys is that gaming prevents the higher order social control functions of the brain from developing normally. Yet when we see the boys interact with each other, they seem to be perfectly socialized for dealing with peers. And they are capable of organizing collective action with each other. In the film, they break out of the hospital together. Unfortunately they just go to an Internet cafe and start gaming so they are caught rather quickly. Lol. In the one hand that looks like addiction…an alcoholic might escape and go to a bar. On the other hand, it’s not like they have anyplace else they could go once they are free. It’s not like they can go home since it’s their parents who institutionalized then. Gaming upon escape seems perfectly reasonable.